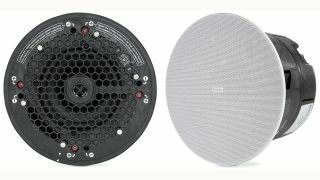 The What: Extron Electronics has introduced the new SoundField XD model SF 26CT, a 6.5-inch, two-way ceiling speaker featuring an 8-inch (20.3 cm) deep composite back can for use in plenum rated ceiling environments. The What Else: The driver complement includes a 6.5-inch (16.5 cm) woofer coupled to a 0.75-inch (1.9 cm) ferrofluid-cooled dome tweeter. With a UL 2043-listed composite speaker enclosure, the SF 26CT meets stringent UL requirements for smoke and heat release in plenum air spaces. A magnetically attached grille with a thin-edged bezel gives the SF 26CT a refined appearance on the ceiling. The SF 26CT offers both direct 8-ohm and 70/100 volt operation with a behind-the-grille, six-position power selector switch. With 70/100 volt taps at 8, 16, 32, and 64 watts, the SF 26CT can be used in applications where a high power distributed speaker system is needed. "The SF 26CT represents a new level of quality and innovation in speaker design," says Casey Hall, vice president of sales and marketing for Extron. "With excellent performance and features that simplify installation, the SF 26CT is ideal for use in applications that require both vocal clarity and musical accuracy." The speakers include a cable/conduit access plate that can be oriented as side mount, for low-clearance ceilings, or as top mount for blind-mounting into drywall ceilings. Exclusive Opti-Torque indicator rings provide a visual indication when the locking arm screws have been sufficiently tightened, preventing damage to the speaker caused by over-torqueing. The Bottom Line: Designed with the integrator in mind, SoundField XD speakers are constructed using a two-piece modular design with a separable back can and baffle, which simplifies installation in both single-trade and division of labor installations. The SF 26CT speakers are sold in pairs and include a five-year parts and labor warranty.